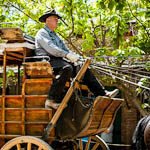 Tom Fraser and family welcome you to check out their Horse Drawn Carriage site and their Stagecoach operation in Columbia California. Tom Fraser’s family has been involved with horses and horse drawn transportation for generations. The photo to the right is one of Tom’s Great, Great Uncle driving a team of horses in Quartz Mountain near Jamestown Ca. over a 100 years ago.